The Intensive Japanese cooking course is for people who would like to learn the Japanese cuisine in depth. There are 2 types of cooking courses according to your purpose. 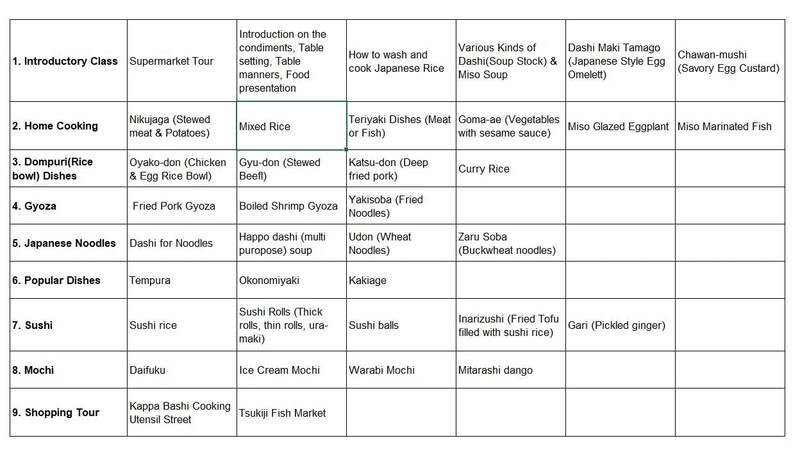 ​If you are a beginner in Japanese home cooking, this is a course for you! This course consists of a 5 classes that will cover the basics of Japanese Home Cooking and teaches you what you can make with the popular Japanese condiments. All classes excluding the introduction class will teach you how to make 1 main dish and 2 side dishes. Every lesson will be served with a different kind of soup and dessert. Course fee : Private Class : 56,700 yen for 5 classes or 12,600 yen for one class. Booking for or 2 or more people : 31,500 yen per person for 5 classes or 7,000 yen for one class. Duration : Each class is 2.5 hours long including tasting. This course is for people who are interested in learning the popular Japanese dishes in a short period of time. It is ideal for professionals who would like to introduce a Japanese dish in your restaurant but do not have the time or budget to go to a cooking school. Once you take this course, you will not only learn about the Japanese dishes, but also, table setting, food presentation, how to use Japanese cooking utensils and much more. A certificate of completion will be issued at the end of the course. The curriculum below is just a sample and can be catered to your preference. For Course fees, please state, which how many classes you would like to take and a quotation will be provided. Duration : Each class is 2.5 -3 hours long including tasting. Classes can be scheduled at your convenient time and date (on weekdays only) If you would like to take a crash course, you can take 2 classes in one day (10 am - 4 pm) depending on my schedule.